13 February - INTERREG Danube GEOTOUR Project Meeting at Bakony-Balaton UNESCO Global Geopark. UNESCO Global Geoparks from Bakony-Balaton, in Hungary, Papuk, in Croatia, Einsewurzen, in Austria, Karawanken-Karavanke, in the border between Austria and Slovenia, Idrija in Slovenia and Hateg, in Romania, as well as National Parks Iron Mountains, in Czech Republic and Djerdap, in Servia, all met at Vezsprem, in the heart of Bakony-Balaton Geopark. This meeting took place within the framework of the INTERREG Danube Geotour Project, and Naturtejo Geopark, as strategic partner, was represented by Carlos Neto de Carvalho. The presence of the Scientific Coordinator of the Portuguese Geopark was needed in order to organize the logistics and the activities to be carried out during the ITB-international tourism fair in Berlin, which will take place early next month. 14 February – Workshop “What are Trilobites?” and Field Trip “The Trilobites and Cruziana in the Ichnological Park of Penha Garcia”. The educational programme was prepared to children from the Kindergarten and the Elementary School of Penha Garcia. The workshop took place in the classroom, attended by 7 children from the kindergarten and 17 from elementary school and their teachers. Here pupils watched an animation on the fascinating marine animals, the Trilobites, whose marks or ichnofossils they could watch in the afternoon, during the field trip to the Ichnological Park of Penha Garcia, close to their school, about 10 minutes walking. Also during the morning, each pupil made a replica of a trilobite in modelling dough and all tasted “Trilobite” cookies, Geoproducts from Geocakes, a partner company of Naturtejo Geopark. Such a Trilobite Day! The teachers asked for this activity before Carnival, so that students could disguise as Trilobites during the Carnival Parade, three weeks later, and so they would become acquainted with the Trilobites and the value natural heritage around the school. The masks and clothes will be made by students supported by their teachers and assistants. Manuela Catana boosted this activity. 15 February - First Meeting of the Advisory Council for the Cross-Border Biosphere Reserve Tejo/Tajo. The Cross-Border Biosphere Reserve Tejo/Tajo International, in the framework of the Man and Biosphere Programme of UNESCO, was created in 2016 and covers 428.000ha shared between Portugal and Spain. Its creation is justified with the high degree of fauna, flora and landscape conservation, as well as cultural and ethnographic heritage values, in a rural area sustainable development promoter. In order to undertake a new dynamic action for the effective implementation of cross-border biosphere reserve Tejo/Tajo international, the Institute for Nature and Forest Conservation, responsible for its management, constituted an Advisory Council, with local intervention agents, of which the Naturtejo Geopark, UNESCO Global Geopark is part. The first meeting was dedicated to discuss and approve the Regulation to guide the action in Portuguese territory and to create sectorial working groups in order to present an Activity Plan for 2019/2020. Naturtejo Geopark was represented by Joana Rodrigues. With the approval of the Advisory Council and Manage Council, the Cross-Border Biosphere Reserve Tejo/Tajo International was formally established. 22 to 24 February - Participation at International Birdwatching Fair - FIO 2019. Naturtejo Geopark participated along with Tourism Centre of Portugal in FIO, in the National Park of Monfragüe (Spain) and UNESCO Biosphere Reserve, in a Fair dedicated to birdwatching. Jorge Costa represented Naturtejo Geopark. 24 February – Touristic Programme in Naturtejo. The Spanish Tour operator Delfinex Viajes from Malpartida de Plasencia brought a group of 30 Spanish tourists to visit Monsanto and Penha Garcia. The group was accompanied by Geolife Tours. 27 February – Field Trip to prepare the final phase of the Annual Project “Know Your Naturtejo Geopark”. This field trip aimed to make recognition of places to select and include in the field trip in Vila Velha de Ródão, as final phase of the Educational Annual Project Anim'a Rocha “Know Your Naturtejo Geopark”. This project has a multidisciplinary approach, involving several subjects and is integrated in the subject Citizenship and Development, part of the NATIONAL STRATEGY FOR CITIZENSHIP EDUCATION, in the mandatory fields of Environmental Education and Sustainable Development. This project, by addressing Nature interpretation and conservation (Biodiversity and Geodiversity) is also part of the Eco-Schools Programme. Three 7th grade classes from the School Group José Silvestre Ribeiro in Idanha-a-Nova participated in this project. 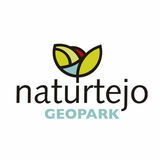 Students will visit several geosites and sites of archaeological interest of Naturtejo Geopark, in Vila Velha de Ródão, and shall present to colleagues the natural and historical-cultural heritage values using existing educational resources previously developed in classroom supported by the teachers. The field trip, as the highest step of the project is organized by the Educational Service of the Municipality of Idanha-a-Nova in partnership with the School Group José Silvestre Ribeiro and the Educational Service of Naturtejo Geopark - UNESCO World Geopark. Manuela Catana joined the teacher Elsa Cantinhas during the preparatory field trip. - MUÑIZ, F., CÁCERES, L.M., RODRÍGUEZ-VIDAL, J., NETO DE CARVAHO, C., BELO, J., FINLAYSON, C., FINLAYSON, G., FINLAYSON, S., IZQUIERDO, T., ABAD, M., JIMÉNEZ-ESPEJO, F.J., SUGISAKI, S., GÓMEZ, P. & RUIZ, F.. – Following the last Neanderthals: Mammal tracks in Late Pleistocene coastal dunes of Gibraltar (S Iberian Peninsula). Quaternary Science Reviews. https:/doi.org/10.1016/j.quascirev.2019.01.013. - PEREIRA, T., CUNHA, P.P., MARTINS, A.A., NORA, D., PAIXÃO, E., FIGUEIREDO, O., RAPOSO, L., HENRIQUES, F., CANINAS, J., MOURA, D. et al. 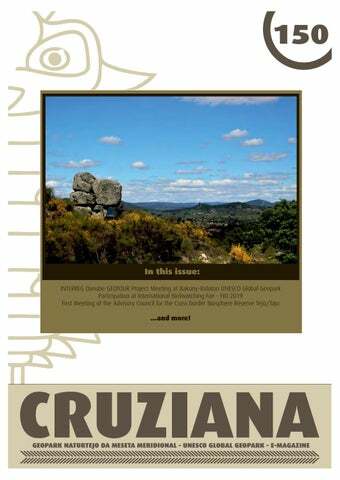 – Geoarchaeology of the Cobrinhos site (Vila Velha de Ródão, Portugal) – A record of the earliest Mousterian in western Iberia. Journal of Archaeological Science: Reports, 24: 640-654. - de VICENTE, G., CUNHA, P.P., MUÑOZ-MARTÍN, A., CLOETINGH, S.A.P.L., OLAIZ, A., VEGAS, R. 2018 – The Spanish-Portuguese Central System: An example of intense intraplate deformation and strain partioning. Tectonics, 37. https:/doi.org/10.1029/2018TC005204. ).